I'm in the middle of a campaign to get selected to stand for Holyrood in Edinburgh just now. It's hugely competitive and so it's really important that people do get a sense of who you are and why you want to stand. For me it's about bringing a lifetime of experience anda real passion to use that experience to improve people's lives and ensure everyone gets the opportunities I have had. To bring more humanity in to our decisions not only in government but in our public services and private sector organisations too. To make love a driver for policy and not let a discredited system of economics dominate. I also want people to know that all that has affected me in life has shaped me, including living with two diagnoses of cancer in the past. So today I posted a short video of why public services and the third sector matter to everyone but especially to me. In an email to the members who have a vote I described how my working class background and life experience including living with breast cancer had shaped who I am and why I want to represent them. And then I read this posthumous article by Evelyn Gillan . 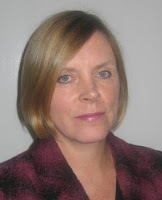 I had met Evelyn a few years ago at a third sector leader event and really warmed to her. I knew she was ill and heard with great sadness of her death this week. But when I read her article I was stunned. Not only did I understand and relate to so much of what she said, it also seemed like she was describing my life too. But of course I was luckier, I have survived my cancer. She spoke my truth, in the words of the song she "sang my life with her words". I urge you to read her article, penned with the clarity of approaching the end of life and the absolute truth of having nothing to lose. Her words describe so well why I too am driven to create a different future for our people. Like Evelyn I believe they deserve so much better than the neoliberal experiment that has caused so much damage. As I read it I felt tearful as it moved me on so many levels. The importance of love and family is a key theme. Thanks for writing so eloquently, Evelyn, may you rest in peace but also know that you are not alone in seeking the change you hoped for and I for one will do my best to do my bit for a different future for our wonderful country and our people.
" It is the hardest thing to leave your loved ones, especially your children, but I take my leave of you with hope that we are rediscovering those things that matter most." My deep sympathy goes to Evelyn and her family, the world is poorer since she has gone. Her article is a powerful legacy. It's said there are many stages of grief with Alzheimer's disease for the individuals themselves and those who love and care for them. A complex combination of loss and frustration, of pain both experienced and then forgotten, of joyful flashes of normal and gut wrenching reminders of what has gone. If you have experienced it, I need say no more. What I have recently learned is that some of that grief is awakened too when external events highlight what has changed. For us it was a family wedding and the realisation that my Mum was not well enough to go. We discussed it, explored the options, tortured ourselves with what ifs and finally accepted it would not work. It would have caused her huge distress and confusion. But the truth is it caused us huge distress to not include her. On the day she was much in our hearts and in our shared stories; we cried for her absence. But then we made a plan. 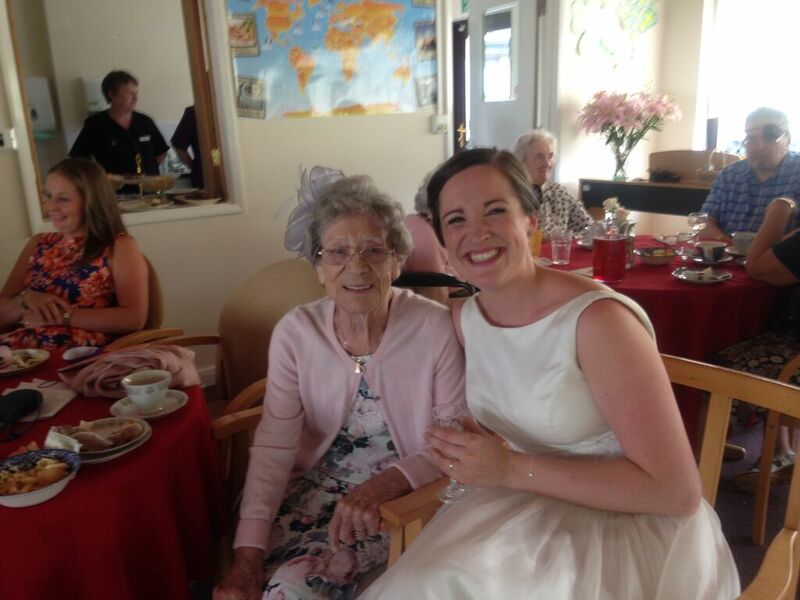 We took the wedding to her in her new home, her care home. I searched for a dress to help her feel special and she did. The care staff were up for it, the family were delighted to do it and so wedding number two happened. The kilts were donned ( even by the Cumbrian great grandsons!) the dresses unpacked, cakes and bubbly purchased and we took the wedding to her. We had told her we were coming but the memory slipped past. The care staff got her ready, cajoled her into a new dress, did her hair, put on some make up and finally persuaded her she could do it. She looked absolutely beautiful but never more so when she saw us all arrive. The joy on her face as she saw them take their vows was simply wonderful to witness. Yes tears were shed but on this occasion they were of real happiness too that she was there and sharing it with us all. We cut cakes, vows were read, poems performed, toasts made and we even had a first dance. It not only lit up her world but those of her friends and carers too. Stories of weddings were shared, memories awoken, hands were grasped as connections across age groups were formed. 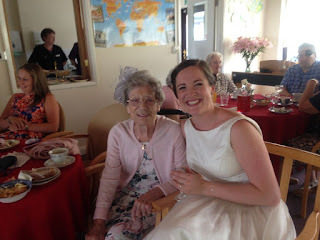 It was so important to us all that we could make her part of the celebration but perhaps what we didn't expect was that we would enjoy it so much as well. It's a strange language we use around care, isn't it. We talk of "putting people in a home." What a reductive way to talk about the need for care. And so our attitudes are shaped. Care homes become a bit scary in our minds, visits there dreaded; they are somehow detached from the communities they inhabit. Is it fears for our own future that cause us to turn away? We rightly express outrage when care homes provide bad care but that's what happens when we turn our backs on the vulnerable-and those who care for them. But I'm sharing our story not to complain but instead to encourage others to do the same, get involved, share your good times and little pleasures too with those you care about. I know we will remember both wedding celebrations for the rest of our lives and in some way both were equally precious and special. I especially want to say a huge thank you to my fabulous family for all they did to make it happen and the wonderful care team at Kirklands. Thanks for making Mums day so special and for caring for her and her friends everyday too. Frankly if I need to be cared for when I'm older, I couldn't think of anywhere kinder. I tend to write poems when I'm moved in some way.Working in Westminster this week was both fascinating and hugely enjoyable. But the shadow of that building has been a powerful one this week when budgets have been spun and webs to trap the powerless have become denser. So the emotion this poem triggered was anger. But I also know that there are those within those uncompromising walls who are fighting for change, for a fairer more equal society. This blog is also to honour and thank them. the sense of what is real. and for what we might become. a past that was once mine. and our land is ours.